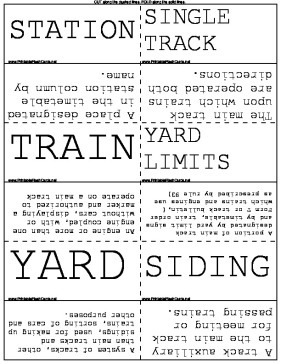 Great for learning about transportation, these printable train flash cards cover the railroad. STATION A place designated in the timetable station column by name. SINGLE TRACK The main track upon which trains are operated both directions. YARD A system of tracks, other than main tracks and sidings, used for making up trains, sorting of cars and other purposes. SIDING A track auxiliary to the main track for meeting or passing trains. SPUR TRACK Short, usually dead-end section of track used to access a facility or loading/unloading ramp. It also can be used to temporarily store equipment. TRACK BULLETIN A notice containing information as to track conditions or other conditions, necessary for the safe operation of trains or engines. TRACK WARRANT CONTROL (TWC) A method of authorizing movements of trains or engines or protecting men or machines on a main track within specified limits in territory designated by special instructions or order. BLOCK A length of track between consecutive block signals or from a block Signal to the end of block system limits, governed by block signals, cab signals or both. FIXED SIGNAL A signal of fixed location indicating a condition affecting the movement of a train. BLOCK SIGNAL A fixed signal at the entrance of a block to govern trains and engines entering and using that block. AUTOMATIC BLOCK SIGNAL SYSTEM (ABS) A series of consecutive blocks governed by block signals, cab signals or both, actuated by a train, engine or by certain conditions affecting the use of a block. SIGNAL ASPECT The appearance of a fixed signal conveying an indication as viewed from the direction of an approaching train; or the appearance or a cab signal conveying an indication as viewed by an observer in the cab. SIGNAL INDICATION The information conveyed by signal aspect. ABSOLUTE SIGNAL A block or interlocking signal designated by an "A" market or the absence of a number plate. DOUBLE TRACK (DT) Two main tracks, on one of the current of traffic is in a specified direction, and on the other in the opposite direction. CURRENT OF TRAFFIC The movement of trains on a main track, in one direction, specified by the rules. CROSSOVER A track connection between two adjacent tracks. CENTRALIZED TRAFFIC CONTROL (CTC) A remotely controlled block signal system under which train movements are authorized by block signals whose indicators supersede the superiority of trains. CONTROL POINT A location designated by number where signals and/or switches of a CTC system are controlled by control operator. CONTROLLED SIDING A siding with CTC or interlocking limits, the authorization for use of which is governed by signal indication or control operator. AUTOMATIC CAB SIGNAL SYSTEM A system which provides for the automatic operation of the cab signals and cab warning whistle. ABSOLUTE BLOCK A length of track in which no train or engine is permitted to enter while it is occupied by another train or engine. TIMETABLE The authority for the movement of regular trains subject to the rules. It may contain classified schedules and includes special instructions.